Powered by VMware EVO: RAIL™, EVO-2000-SM Series combines compute, networking, and storage resources into a hyper-converged infrastructure appliance to create a simple, easy to deploy, all-in-one solution offered by VMware qualified hardware. Pre-Configured EVO hyper-converged system appliance, powered by VMware EVO:RAIL software provides optimization with high-performance, efficiency, resiliency and configuration versatility on Industry-standard commodity hardware VMware EVO:RAIL combines VMware compute, networking and storage resources into a hyper-converged infrastructure appliance to create a simple, easy to deploy, all-in-one appliance solution. 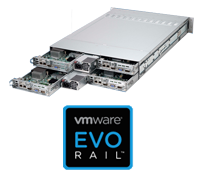 The EVO products, powered by VMware EVO:RAIL provide a software-defined data center solution based on hypervisor-converged distributed architectures. EVO products are modular building blocks which provide a simple and inexpensive network, compute and storage virtualization solution to implement a hyper-converged data center initiative, while providing a path to scale-out the virtual storage and compute infrastructure by adding additional blocks as needed.